Ottawa | Reuters — Canada’s trade deficit in February jumped to $2.69 billion from $1.94 billion in January as rail transport problems slashed exports of wheat and canola, Statistics Canada said on Thursday. The deficit was larger than the $2 billion shortfall predicted by analysts in a Reuters poll. Canada has only recorded two monthly trade surpluses since October 2014. Exports grew by 0.4 per cent as shipments of motor vehicles and parts rebounded by five per cent following atypical Canadian auto plant closures in January. Exports of aircraft and other transportation equipment rocketed by 19.6 per cent. But exports of farm, fishing and intermediate food products dropped by 17.2 per cent, the largest fall on record. 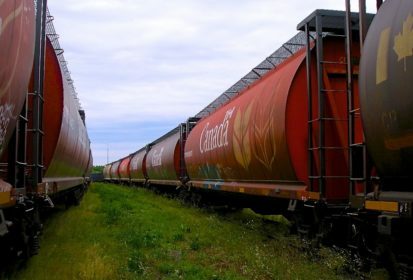 Continuing shortages of rail cars in western Canada cut exports of wheat by 41.6 per cent and canola by 40.1 per cent. “We believe March data should be stronger,” he said by phone. In real, or volume terms, exports rose by 0.6 per cent. Imports rose by 1.9 per cent on a 15.4 per cent surge in shipments of energy products, pushed up by higher demand for crude oil and crude bitumen. Imports of motor vehicles and parts climbed by 1.7 per cent as the auto plant shutdowns ended. “But I think indications of growth coming in weaker than expected are going to dampen market expectations of any near-term tightening by the Bank (of Canada),” he said in a phone interview. Canada sent 75.4 per cent of all goods exports to the U.S. in February and would be hurt if the trilateral agreement collapsed. — David Ljunggren is Reuters’ political correspondent in Ottawa; additional reporting by Fergal Smith in Toronto.